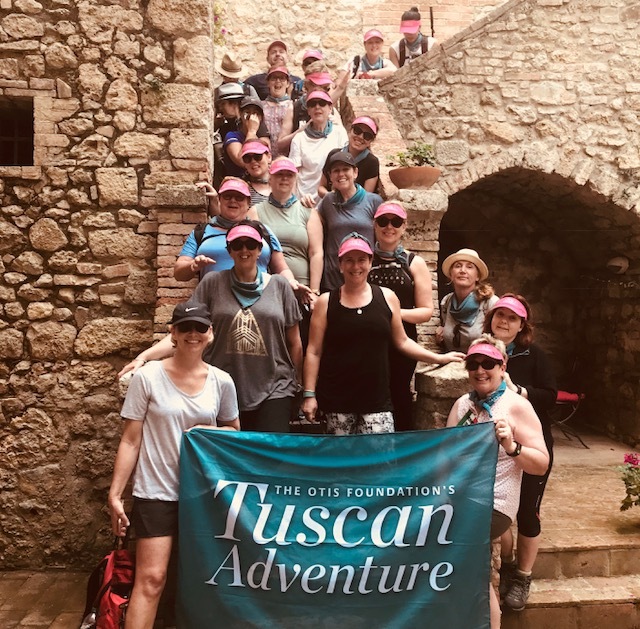 Follow our blog to keep up with the participants taking part in the 2018 OTIS Tuscan Adventures. 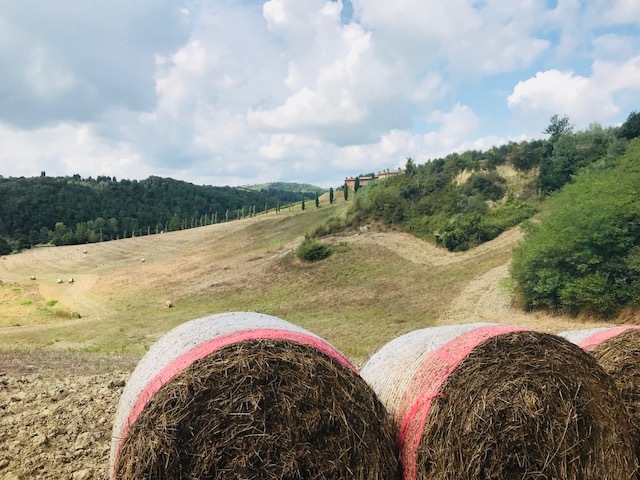 On this page we will share stories and photos of our daily travels. 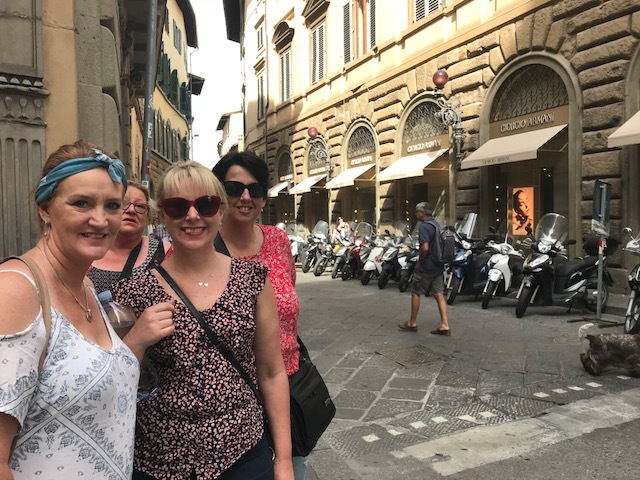 Today the adventure-of-a-lifetime began as we arrived in Florence, Italy. 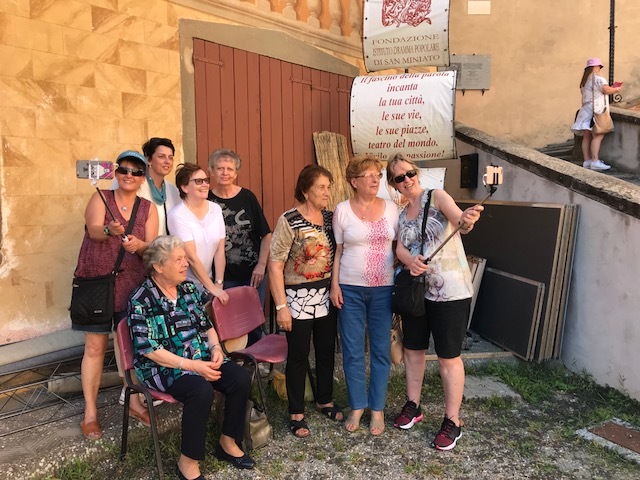 Over the past few days, many of the participants have enjoyed time spent in different parts of Italy and Europe. 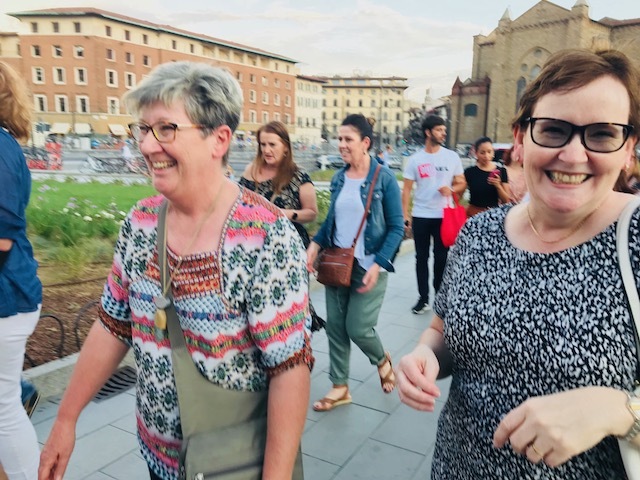 Those who've spent the past days in Florence have spoken of their love for the city, as have those who have spent time in Milan and Rome on their way to tonight's first official gathering. 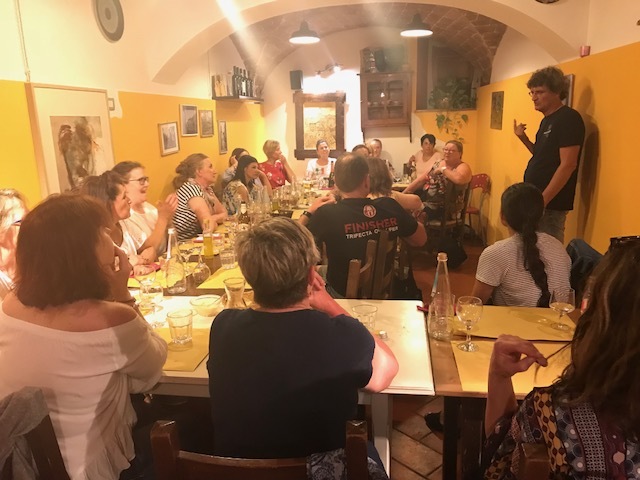 All the participants had the chance to meet one another and we had a delicious dinner, caught up on stories about each others reasons for joining this adventure. 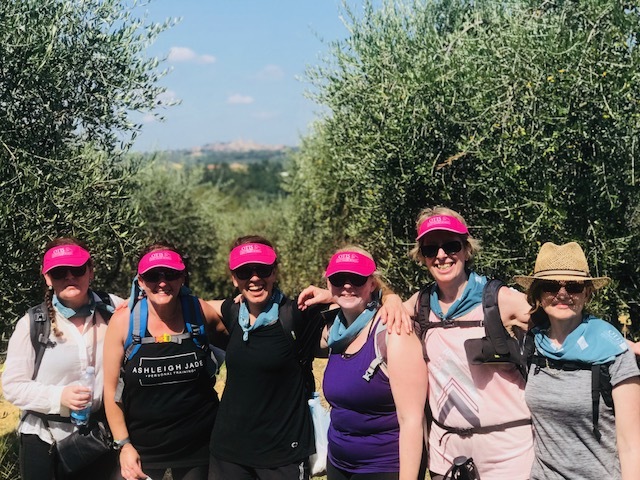 We celebrated the incredible fundraising by participants in the lead up to this incredible experience , which currently sit at just over $111,000! An amazing figure. 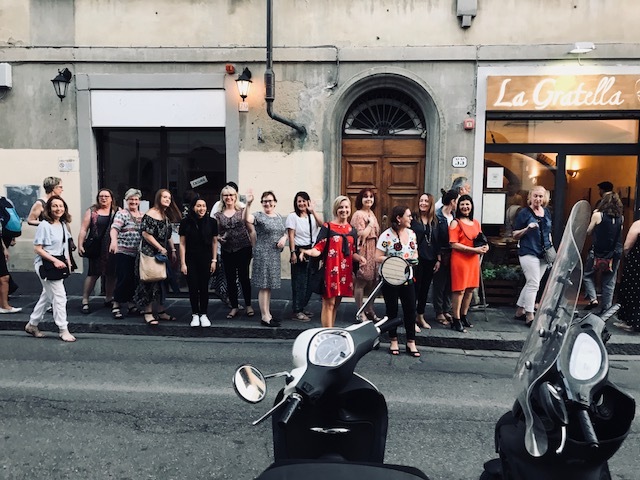 Tonight we have retired for an early evening to prepare for tomorrow’s day in Lucca! Happy Father's day especially to our lone male participant, Andrew. 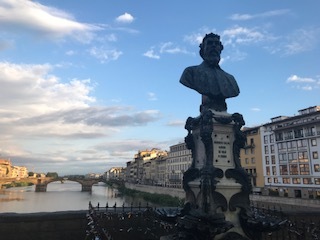 This morning we woke to the beautiful sights and sounds of Florence. 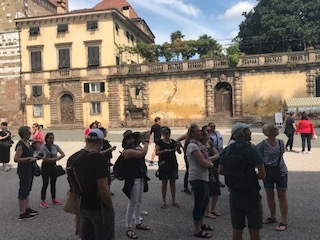 Some of the participants have spent a number of days exploring this amazing city and for those who just arrived, made the most of the morning. 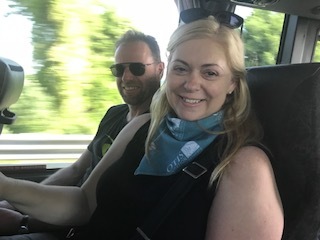 After breakfast, we were transferred by private vehicle to the charming town of Lucca. 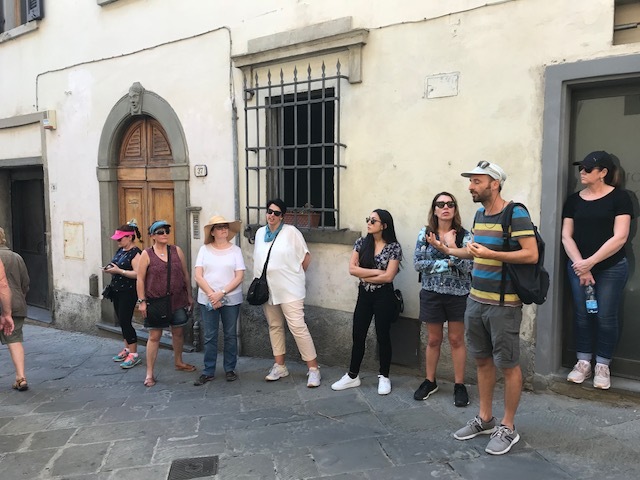 After arriving, our guide Francesco led us through the cobbled streets on a informative walking tour of Luccas many historic sites. 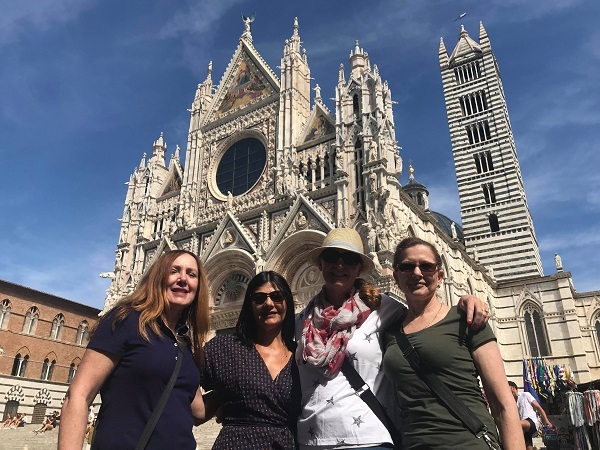 We were in awe at the imposing Renaissance walls, cobbled streets and beautiful Piazzas and paid a visit to Cattedrale di San Martino, the Palazzo Pfanner and Lucca’s monumental City Wall built in the 16th and 17th centuries. 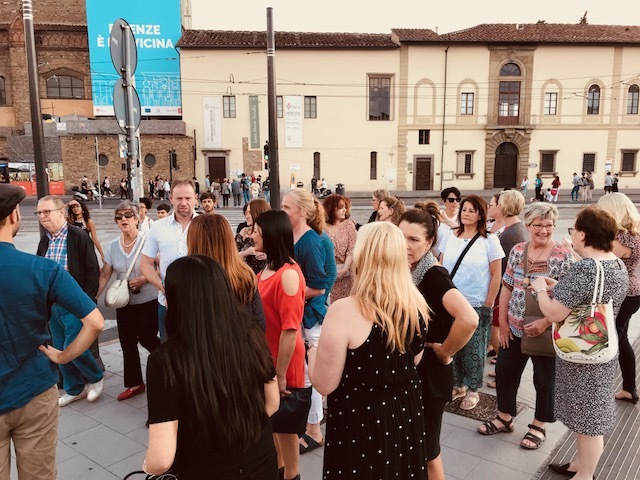 We concluded the tour at Piazza Anfiteatro where many of us stayed on and enjoyed a lunch together before enjoying a free afternoon to take in Lucca's many historic sites. 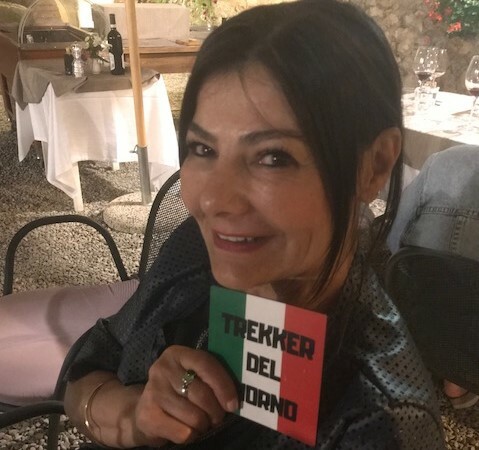 This evening we met for a shared dinner together and presented the first of our daily "Trekker del Giorno" award (Translation: Trekker of the day). Andrew Campbell proudly wears the badge in recognition for being away from his two children on Father's Day. 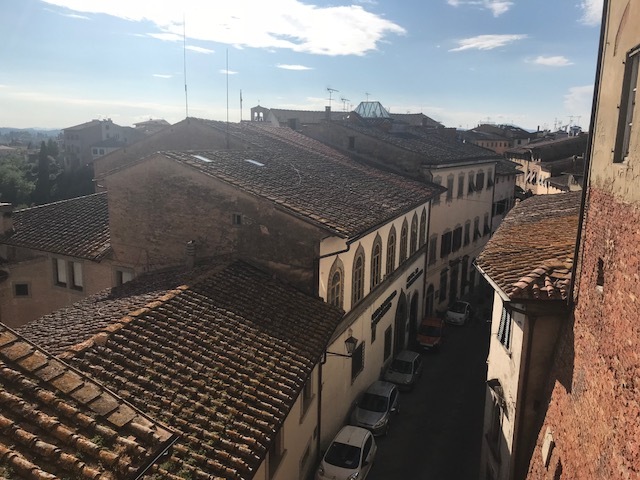 This morning we had a relaxed start, with free time to further explore the walled city of Lucca. 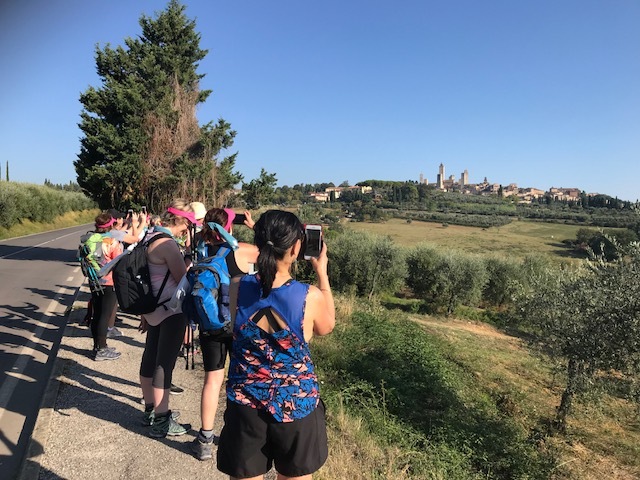 Many took advantage of the wide path that sits on top of the wall, walking or cycling the 4km path and taking a different vantage point over this gorgeous place. The shopping was also a lure for many, purchasing gifts and tokens from their travels. 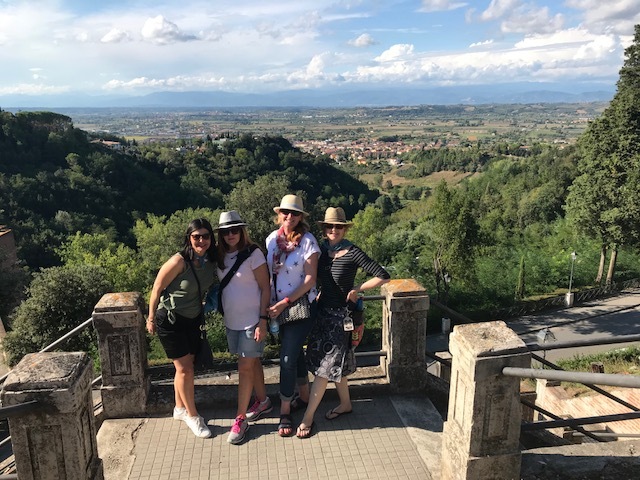 Around noon we took a bus to the mountain top village of San Miniato. 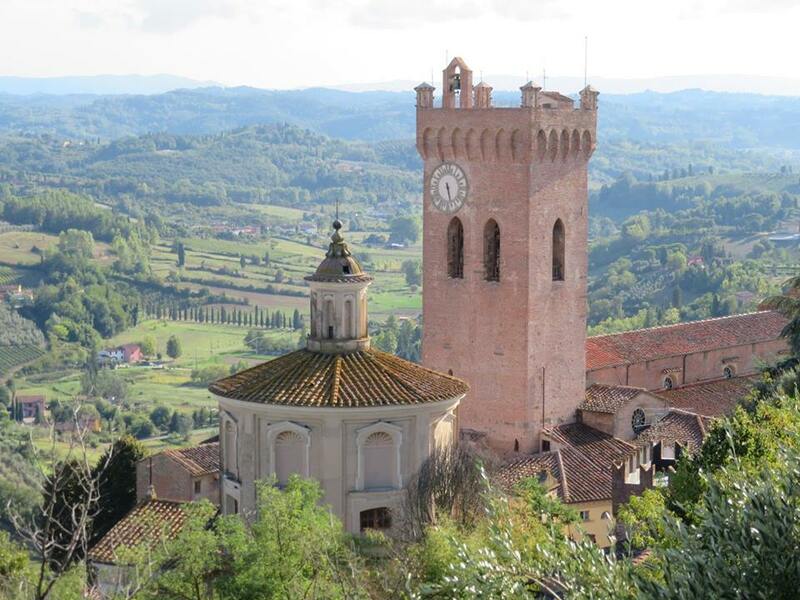 With it's beguiling medieval lure, San Miniato is the quintessential Italian dream! 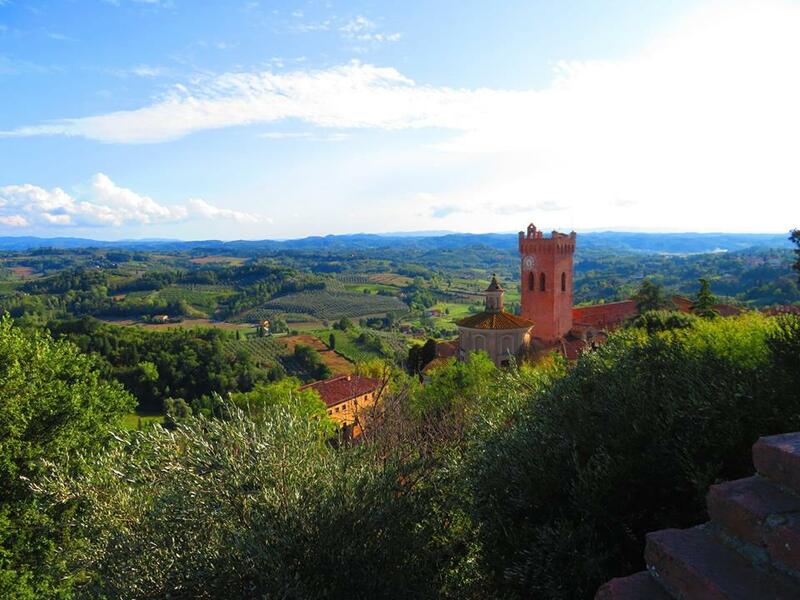 Stunning palaces and churches, delectable food and wine, it will be difficult to leave tomorrow. 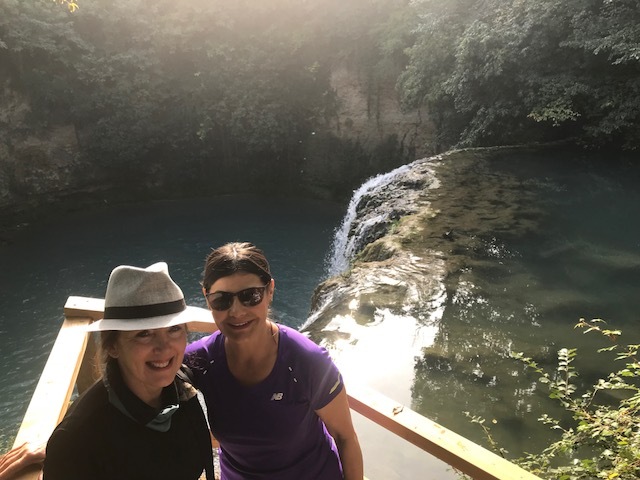 One participant, Kym, said recently that every town had a different soul and this could not be more true as we arrive. 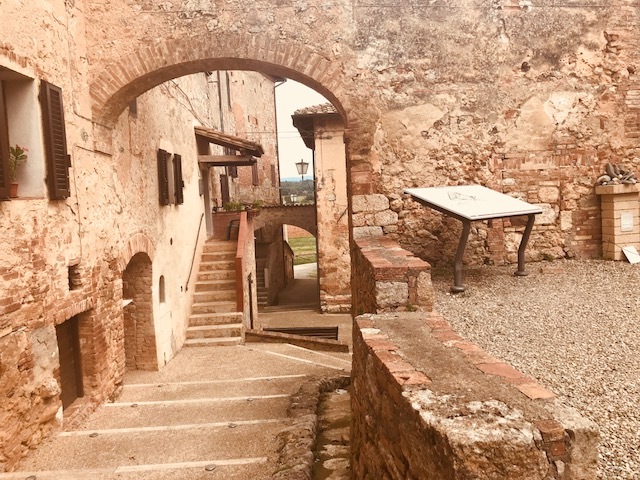 Just as we think that we’ve found the gem of Italy that we couldn’t love anymore, we find the next town is even more special. 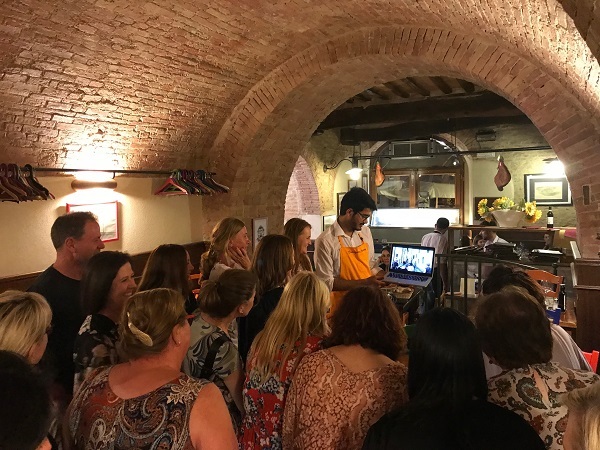 Tonight we farewell our guide so far, Francesco. 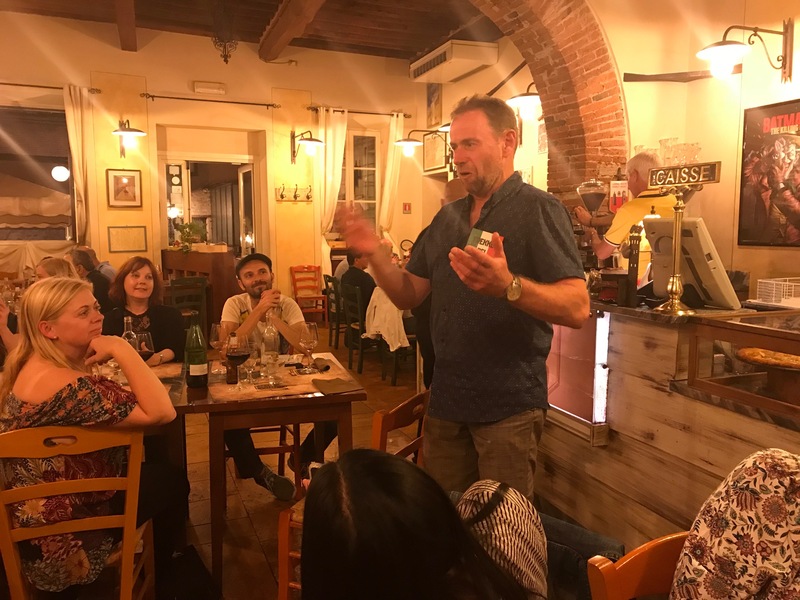 He has shared so much knowledge on the towns we have visited so far and we thank him for his experience and self-evident passion. 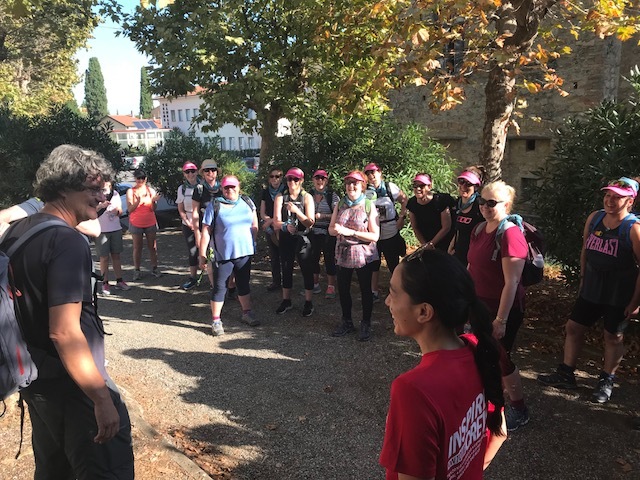 We welcome Andreas who will guide us through the trek which begins tomorrow morning. 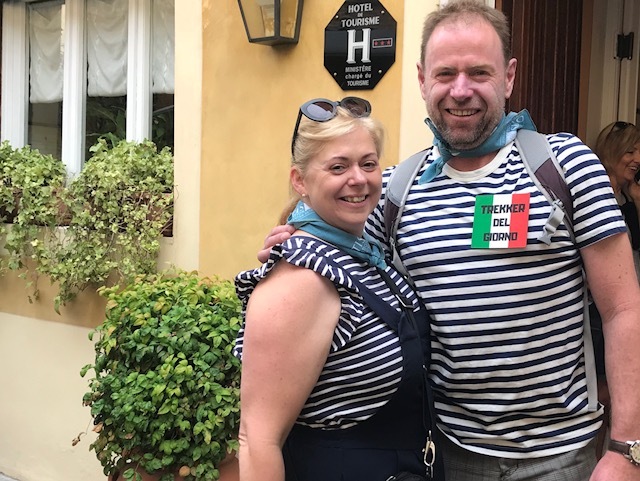 Andrew Campbell took his role as "Trekker del Giorno" so seriously that he felt it appropriate to dress as a middle aged French man and match his gorgeous wife Lisa!! We love that they’ve had so much fun with this award. 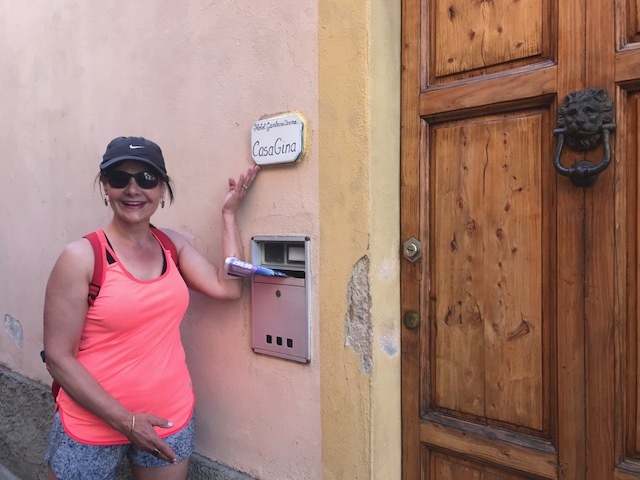 Day 3 "Trekker del Giorno" - Today's award goes to Sandy for her apt shopping skills. 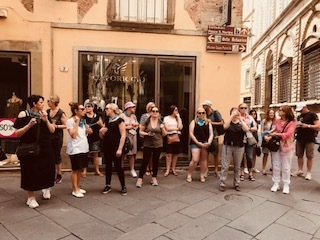 This morning, Sandy visited a boutique in Lucca looking for the perfect outfit. She found a lovely cardigan, which she tried on with the help of a fellow trekker. Liking the style, Sandy requested the cardigan in another colour - only to be told that it was in fact not an item stocked by the shop, but the personal item of a fellow shopper who has placed it down for just a moment! Wow!! 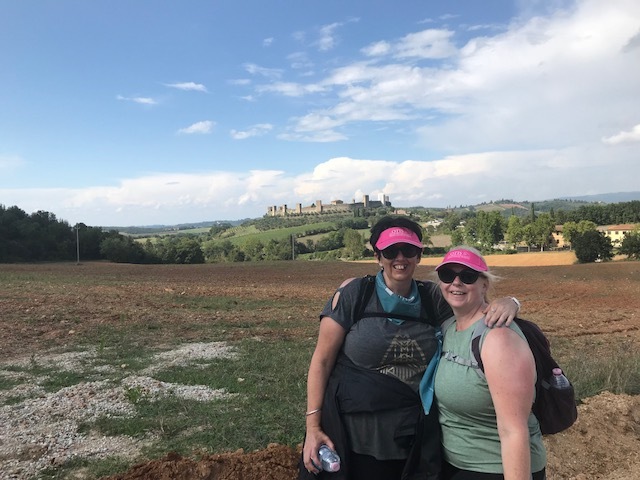 The first day of walking is over, but what a huge day we've had. The expected 14km, was upgraded to 19km last night by our guide (after an apparent error in the notes!). 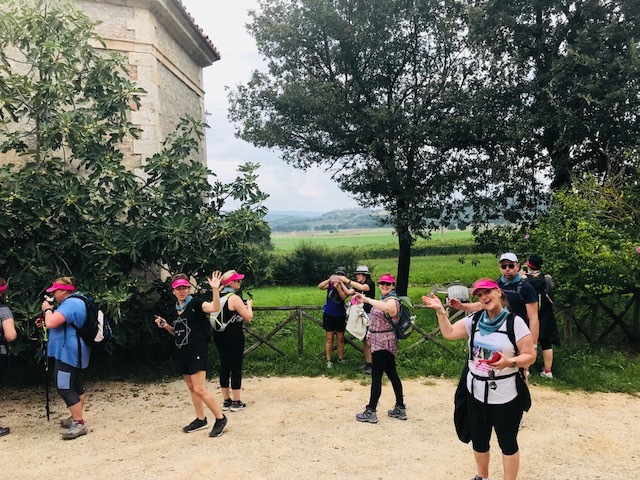 As it turns out the 19km was only to the arrival point and not our hotels, so for some of us that was an extra 2.5km or those staying at the higher hotel - an extra 3.5km!! 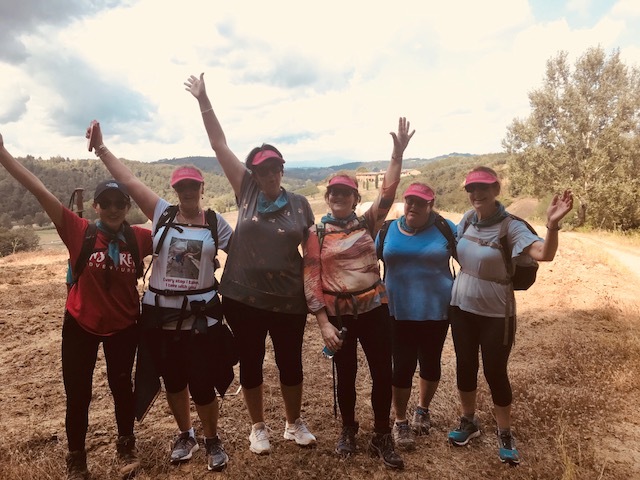 Altogether step counts above 35,000 and 24km were recorded. But what a day of scenery and walking. The weather gods were kind to us, with the clouds coming over at various parts of the day to offer some relief. 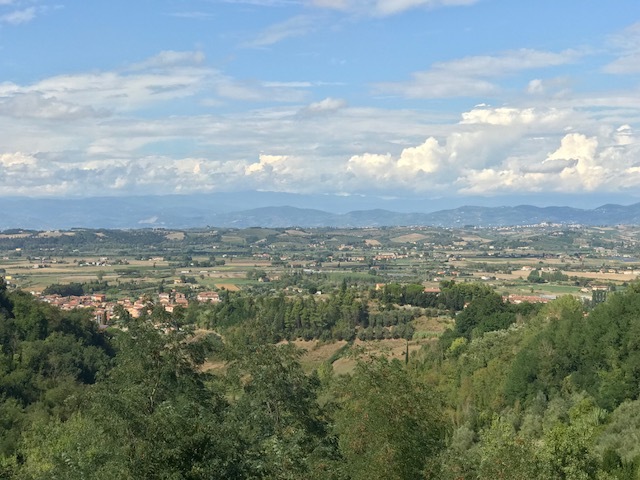 At most points we had views of magnificent Tuscan scenery and rolling hillsides. 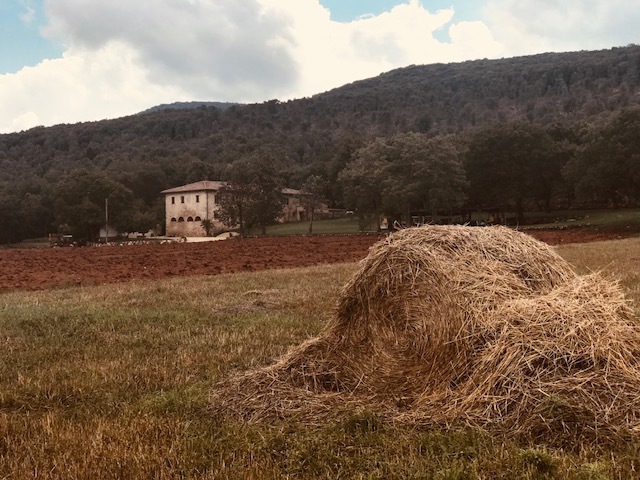 The rain threatened much of the day and could be seen in the distance, but we only had a short period of welcome rain. 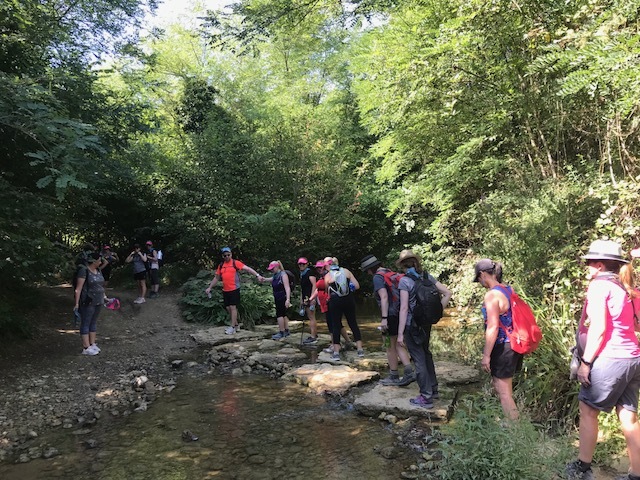 The group worked as a great team and supported each other to all arrive at "the bar"- the unofficial entry point to Gambassi Terme. 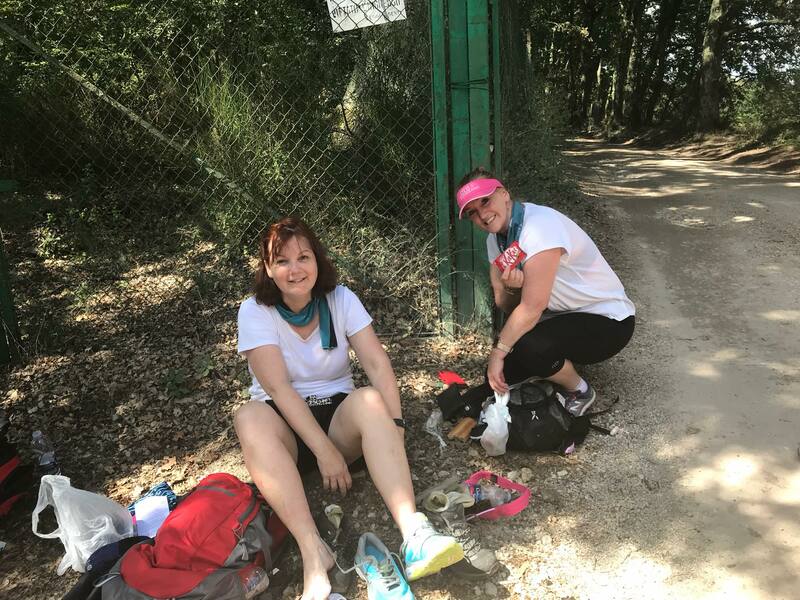 Although a long day, we've arrived feeling proud of our walking and without huge physical toll (at least so far). There was some confusion with luggage on arrival, with the luggage getting mixed between the hotels!! All was well and worked out in the end. 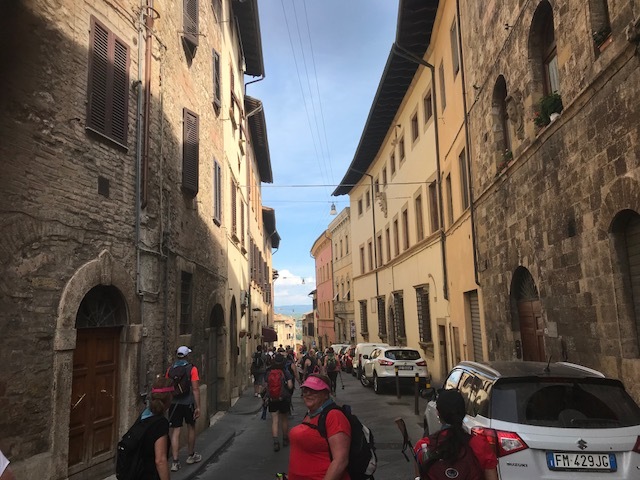 Tonight we share a meal near the lower hotel and prepare for tomorrow's day of walking. 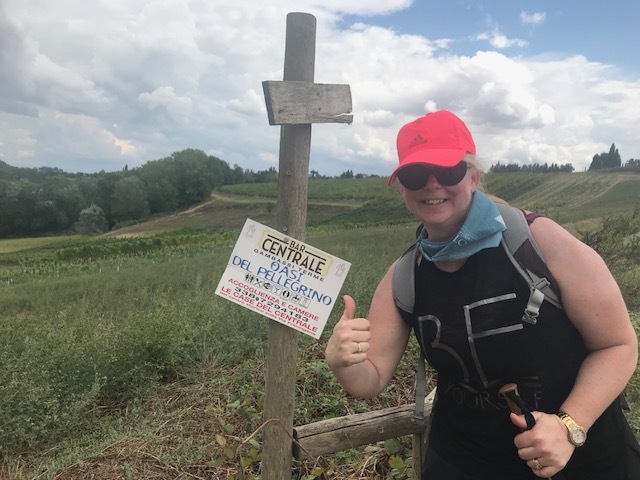 Day 4 "Trekker del Giorno" -Congratulation to Leanne Williams, who made her own music on route! 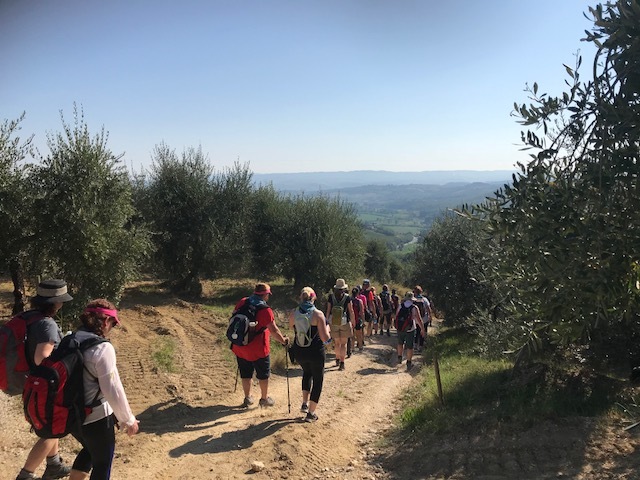 This morning after breakfast, we began our walk descending from Gambassi Terme before reaching another steady climb. 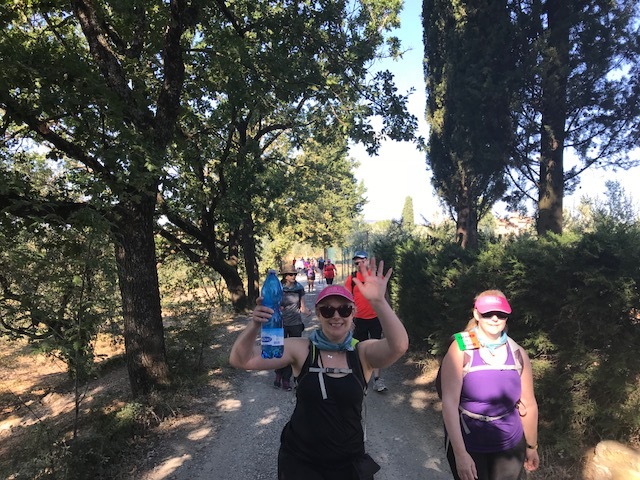 Today’s route was shorter, however the sun was shining for the most part, making it particularly hot! 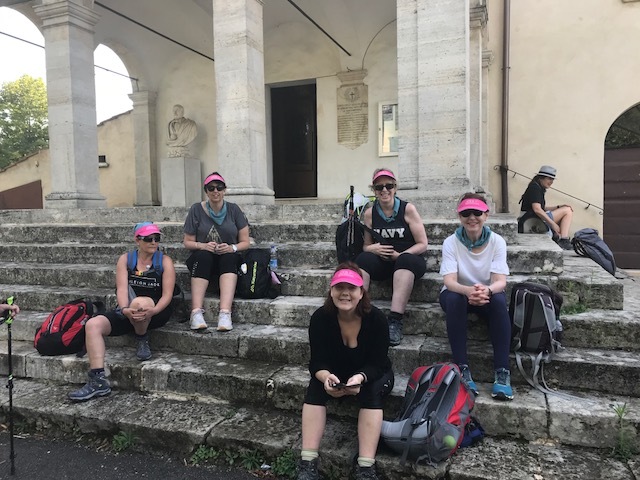 After yesterday's long day of walking the team have all pulled up well, apart from some bit of heat rash and a few minor blisters. 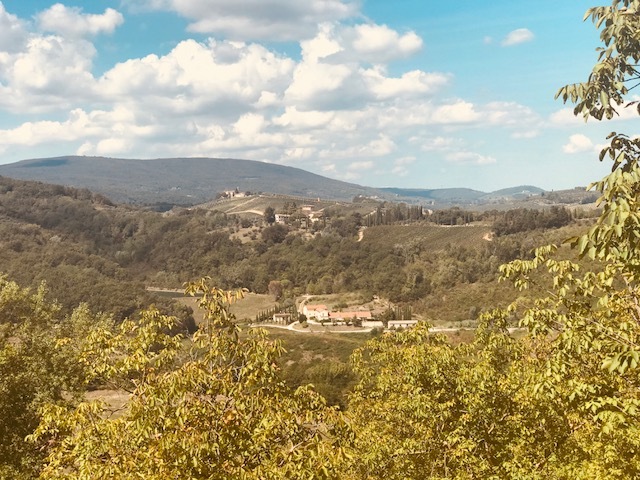 The stunning scenery as we walked past the world famous Chianti vineyards was incredible and there were so many vantage points to capture the panoramic view. 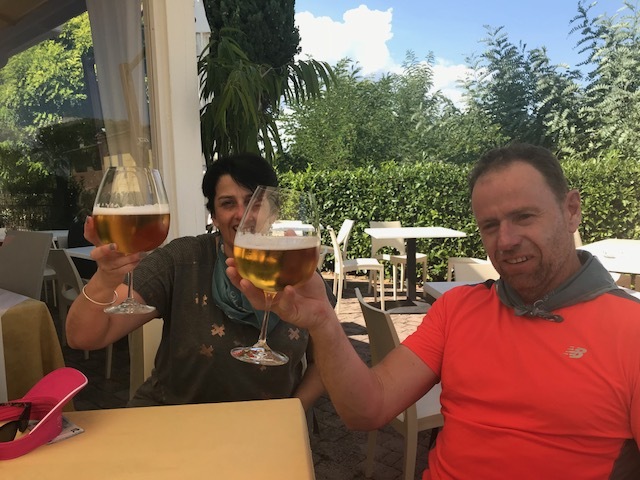 We stopped for lunch in Polcone, where most had a cool, refreshing drink which gave us the stamina to push on. 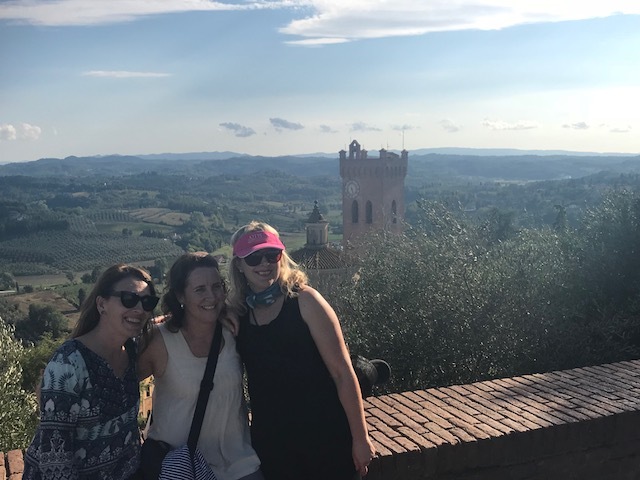 We arrived at a Monestry and could clearly see the unmistakable outline of San Gimignano's medieval towers. 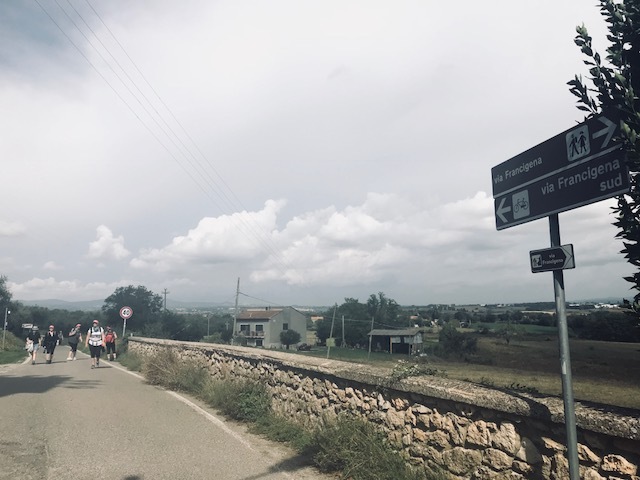 We took on another steady climb as we reached the outskirts of this breathtaking USESCO- listed town. There are plenty of fascinating churches, palaces and cathedrals that we explored with or guide Andreas.. 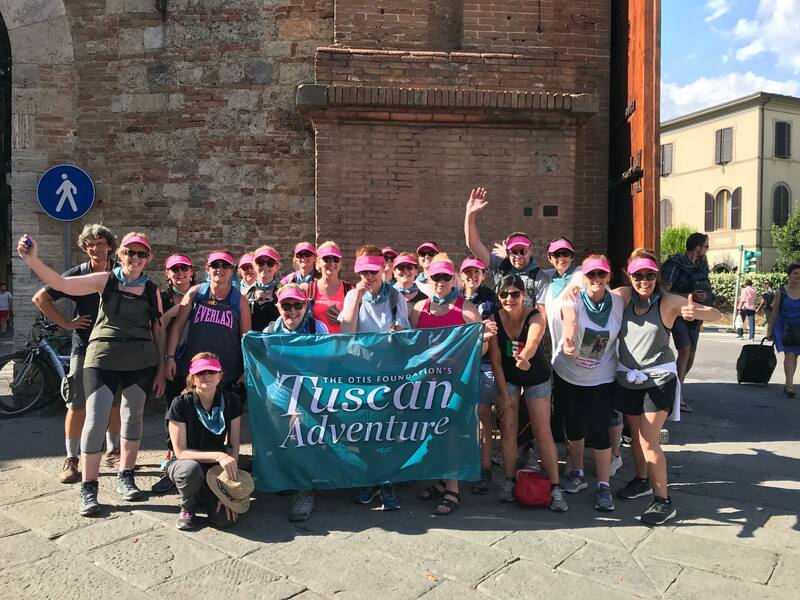 Some participants took advantage of some down time and chose to rest at the hotel before joining the team for a delicious Tuscan dinner at the hotels restaurant.tonight. 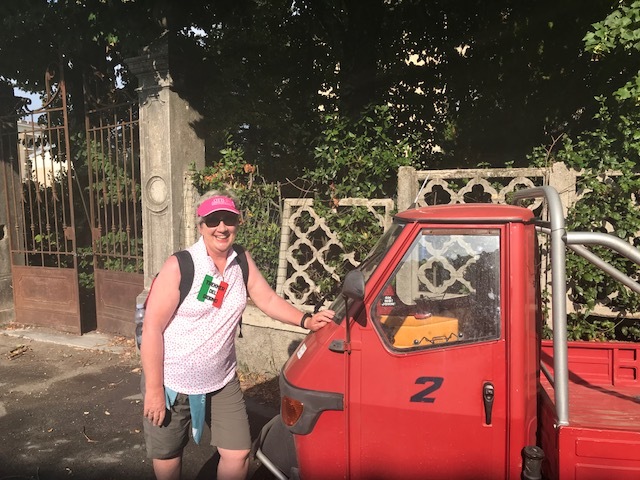 Day 5 "Trekker del Giorno" - The Campbell family again take home the Trekker del Gionrno. Lisa took the award tonight after showing enormous courage today to overcome fatigue and a persistent headache and also cope with the overnight passing of a close relative. 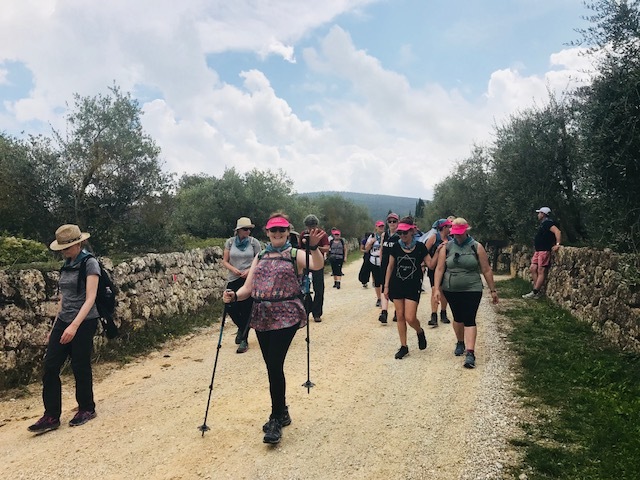 Lisa chose to walk despite this and not only completed it easily, but led the pack for the majority of the day. 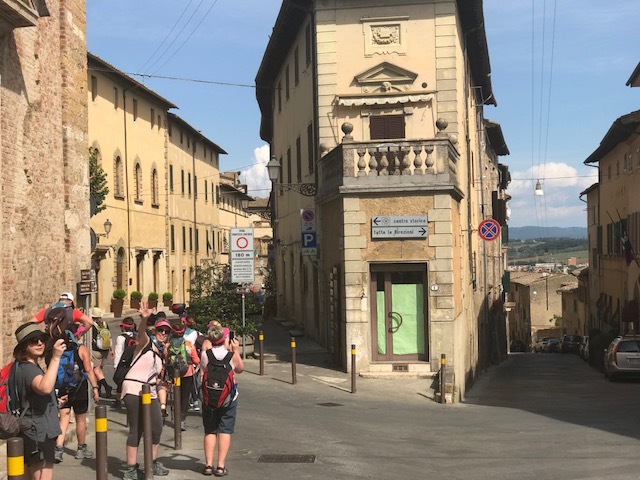 Today we bid farewell to San Gimignano., but not before many of the trekkers found a market conveniently located right out the front of our beautifully placed accommodation. Footwear priced for just 10 euro was too much of a bargain to pass up and many opted to hang bags of shoes from their packs rather than miss an opportunity. 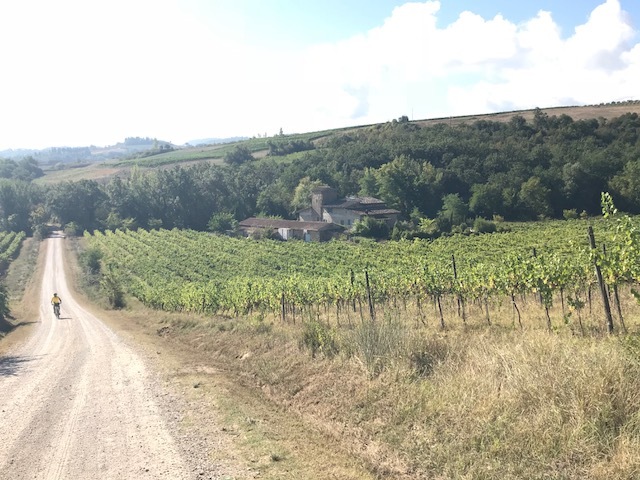 Andreas our guide gave us the option last night of two routes, one with three significant valleys to cross and the other offered a plateaued path for much of the way and only one steep incline and decline. Clearly the group opted for option 2!! 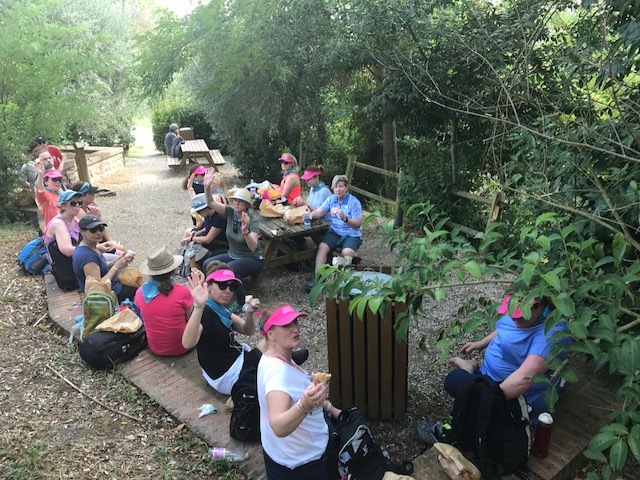 This path took us through olive groves and cypress avenue’s and offered a lunch stop at of an ancient village where they had recreated the perimeter of a former church site. 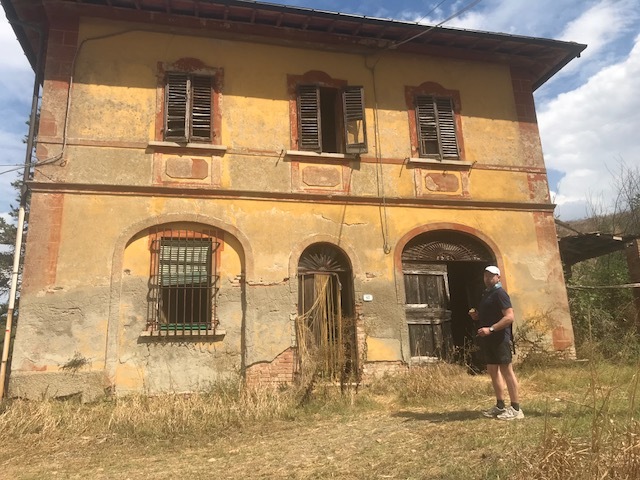 We've come to understand that Andreas (our guide) continues to stretch the distance we walk over the day - today's 14km day has been rerecorded at well over 18km!!! 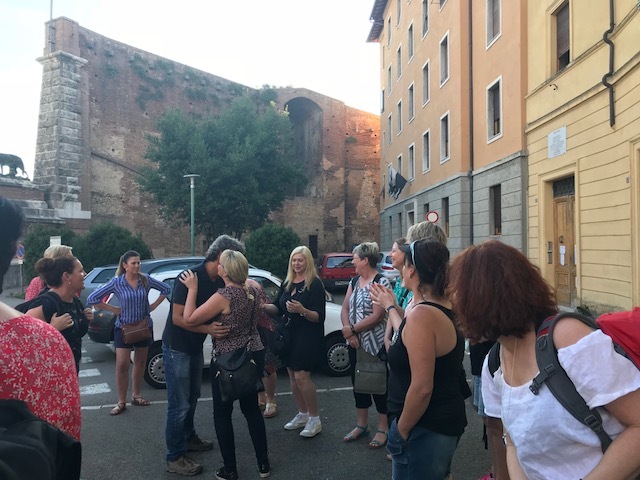 However, he has got to know our group and understands a stop at the town's first bar is a must!! 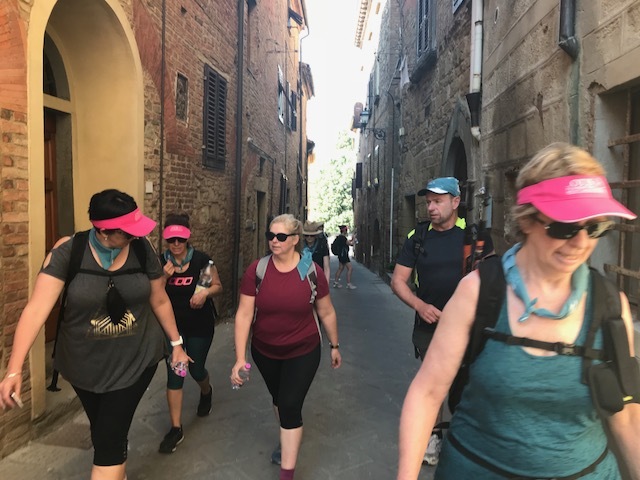 Some trekkers enjoyed a Chianti before dinner in the piazza near our hotel while others took the opportunity to rest after three big days of walking. 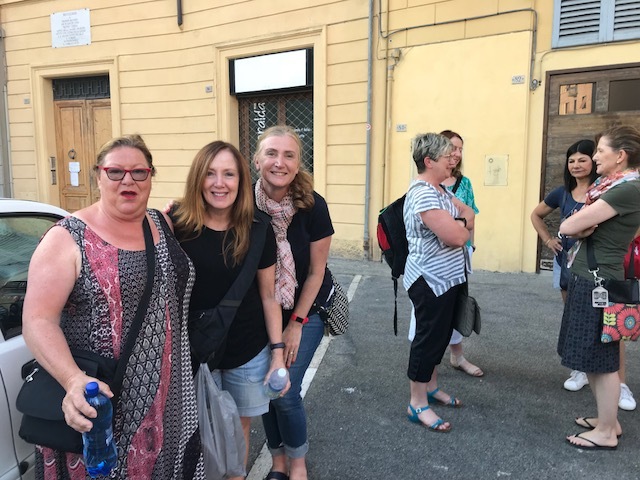 We all reconvened for dinner at the lower level of our hotel in preparation for an early start tomorrow..
Day 6 "Trekker del Giorno" - Sandra Davey had an amazing day today. 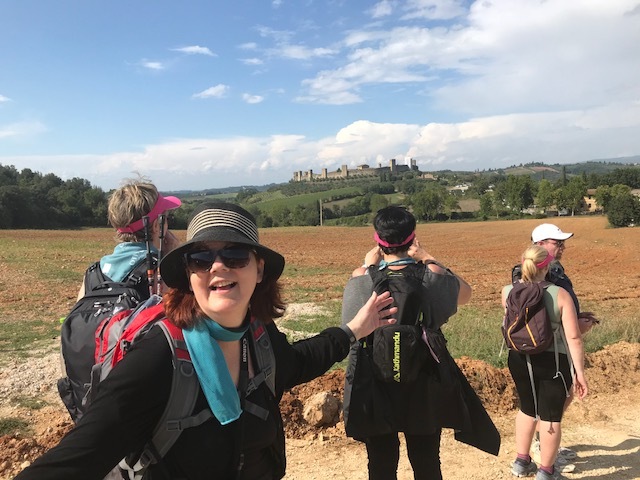 For many years and especially the past three days, she has walked with nerve damage to her feet - one of the complications of her breast cancer. Sandra continuing walking all day, without any mention or complaint. 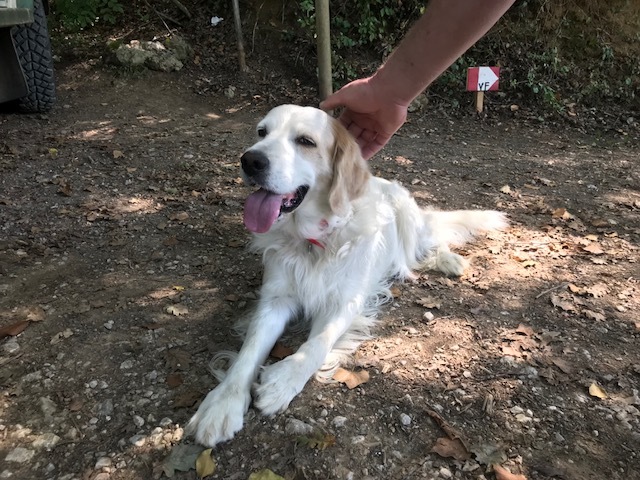 Only once we arrived in Colle Val d’Elsa and she changed to sandals did we realise her pain. Amazing effort. 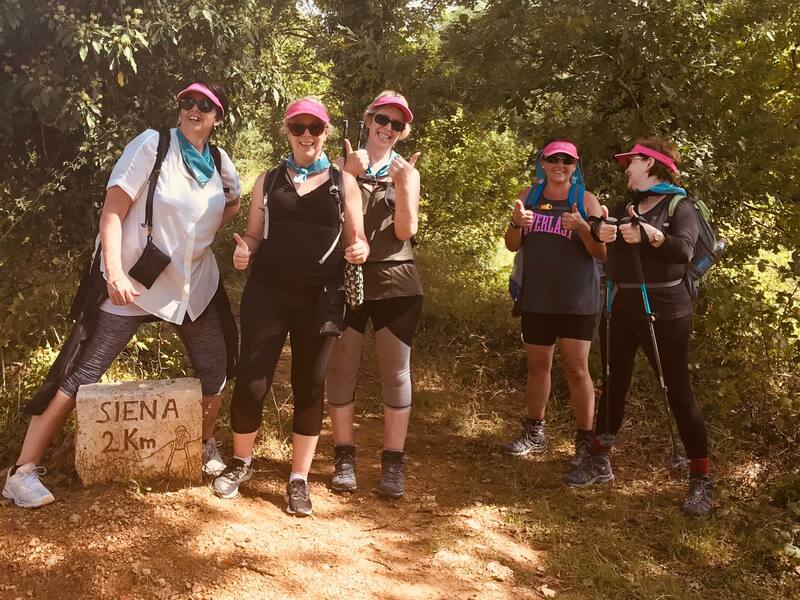 It was tough getting up this morning after three taxing, yet rewarding days of trekking. Yet again, our estimated distance was extended by a couple of k's, smashing out a further 18k's today! 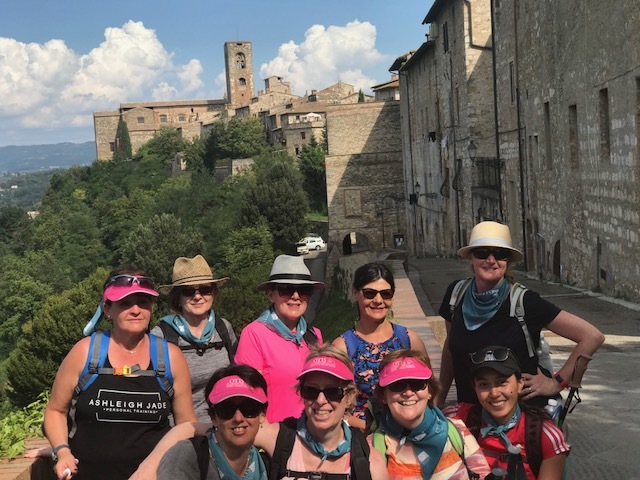 We are so very proud of this amazing group of people who have all been able to trek every day despite sore feet, tired muscles and blisters! 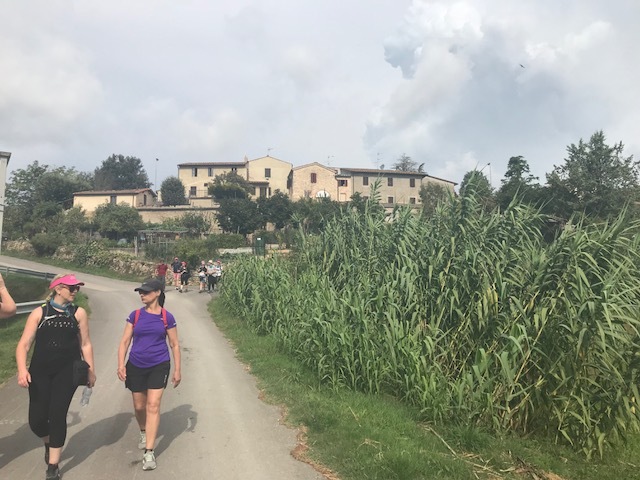 This morning after brekky we took off from our accommodation in Colle di Val d’Elsa and again we were tempted by a market on our doorstep, some traumatised that there was no time to shop. 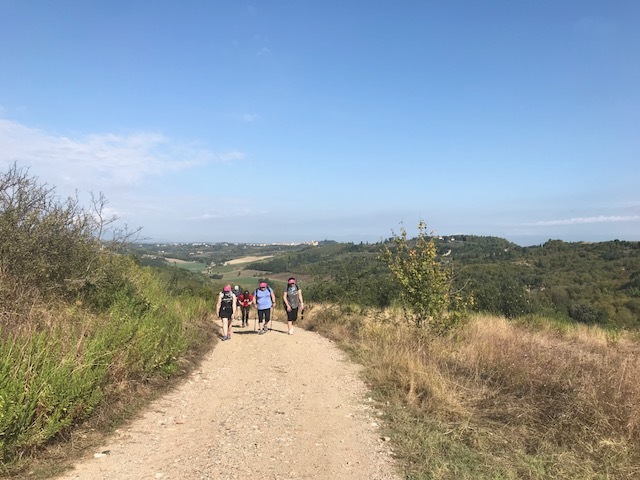 Our route today took us along tree lined roads before descending into Castel Pietraio where we took our daily team photo and then up to the densely forested hill of Montagnole. 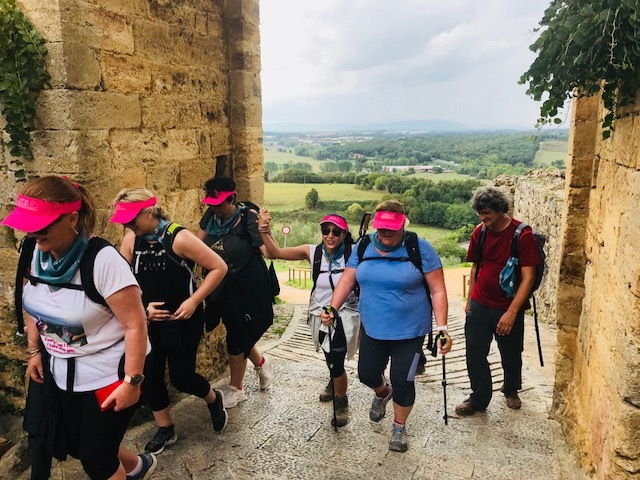 Our path along the Via Francigena took us up to the small hilltop village of Monteriggioni, but not before the team were required to trek up a massive incline! 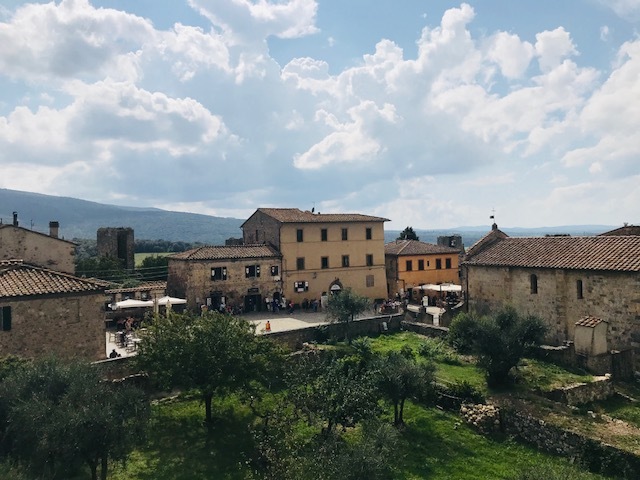 We had a short visit here where some sat, had a cool beverage, or a delicious gelato and others had extra energy to climb and take in the vista from the top of the medieval wall that encompasses the town. 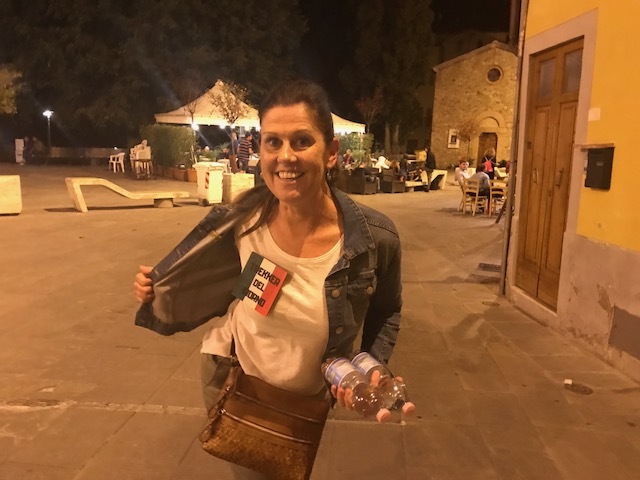 Day 7 "Trekker del Giorno" - after a record number of nominations, Gina won today's award after being super helpful with interpreting over the past few days not only with the locals but also with our Italian guide. 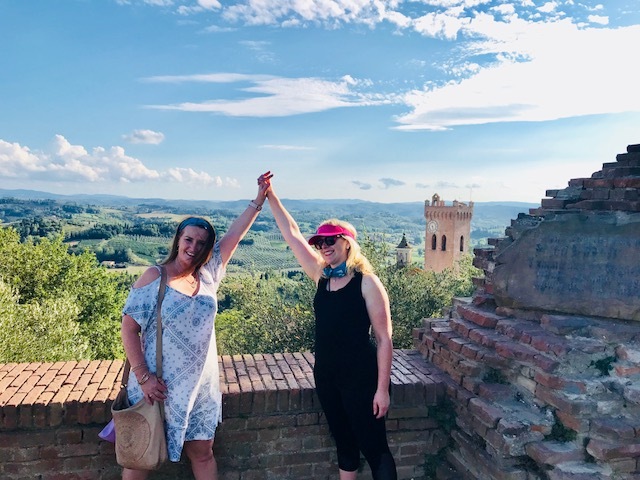 Today we left Monteriggioni and trekked our final leg to Siena. 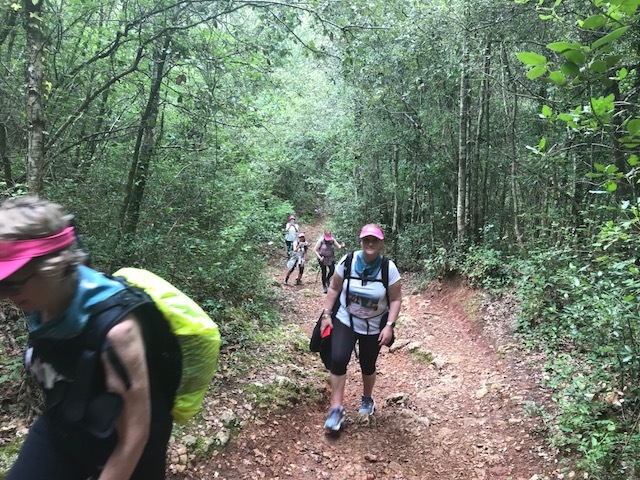 We were all quite apprehensive about the 19km distance that lay ahead, given many were nursing minor injuries and fatigue. 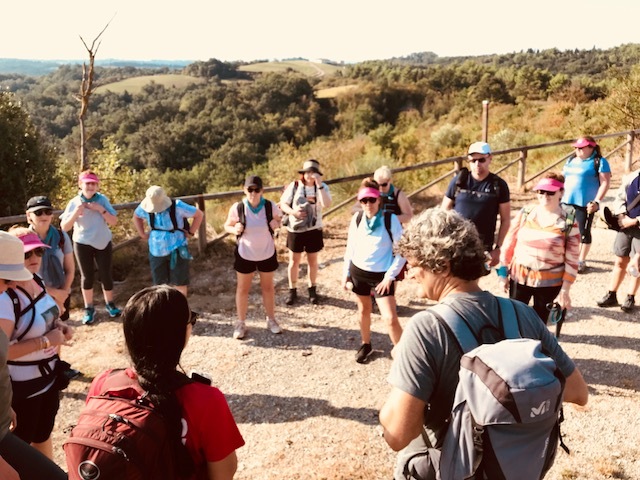 Our guide Andrea's informed us of the first stop 5 km's in was an important one, not only for us but for the man who ran a small cafe style rest stop, providing food and beverages for people doing the Pilgrimage to Siena. 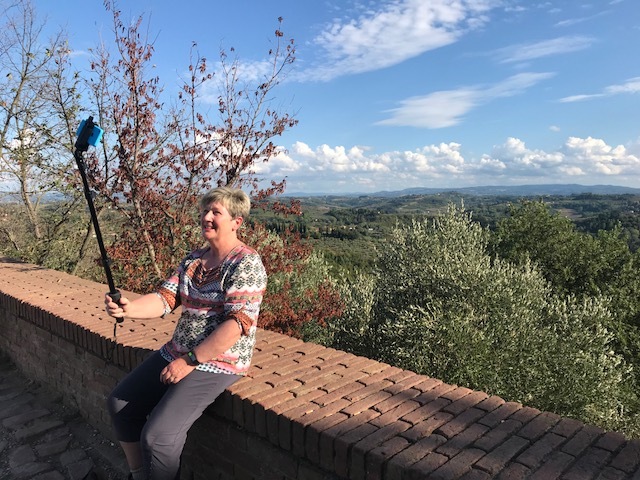 Marcella and his wife did this together until 8 months ago when he very sadly lost his life partner. He continues on this generous and selfless work even though he misses her terribly. We were humbled by his kindness. 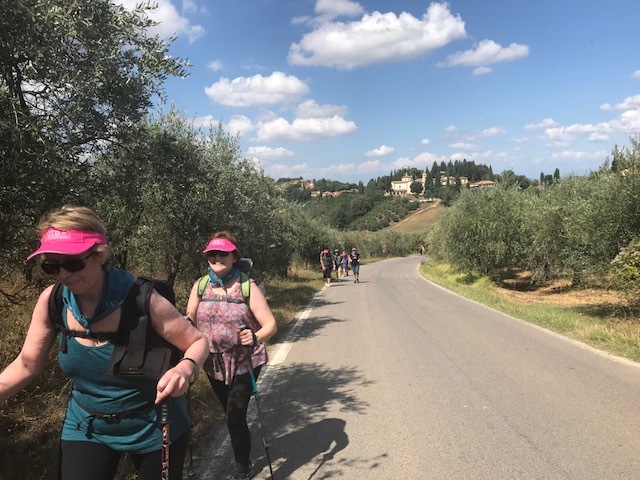 The path was quite different to previous days, taking us through Tuscan forests, open fields and onto suburban roads as we entered the outskirts of Siena. 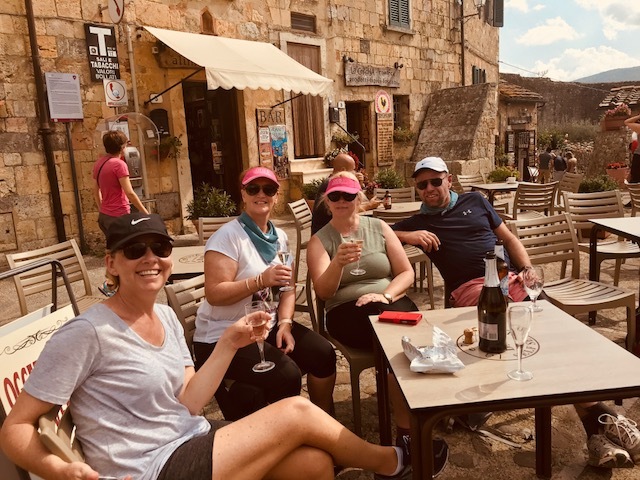 Andreas explained that the route was "More or Less" flat for the most part - we all knew that this really meant not flat!! 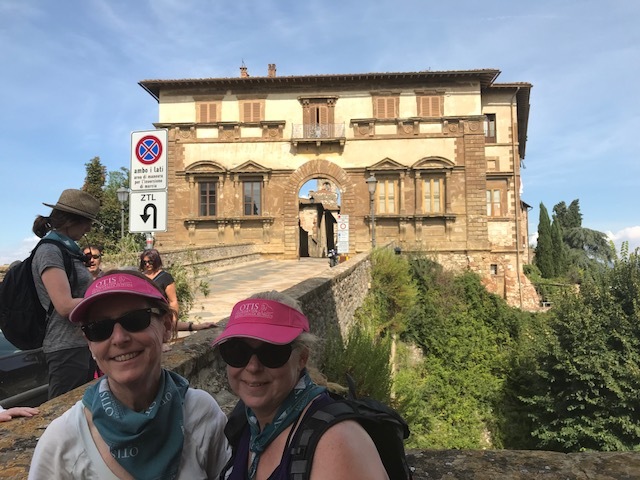 We have come to learnt that Andrea's idea of flat differs greatly to ours and his distances continue to lengthen as we approach! 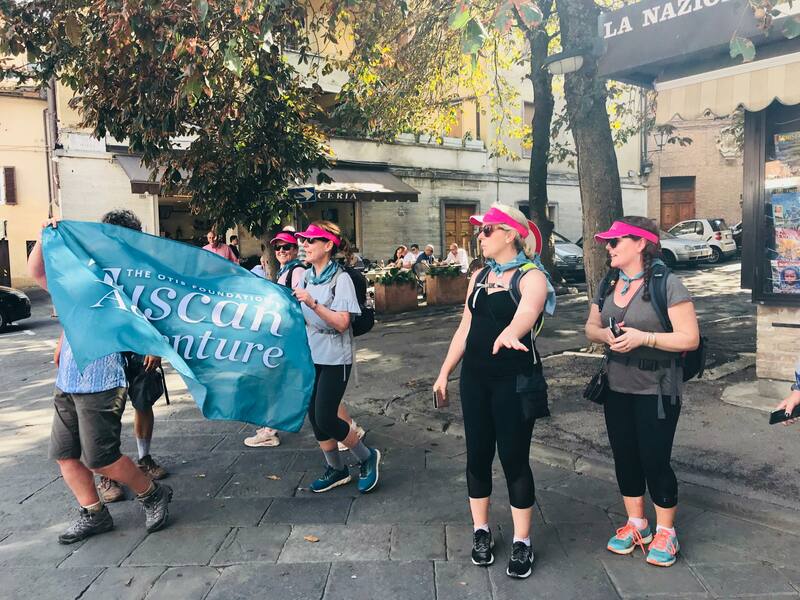 Every member of our team was able to walk for the fifth consecutive day and all trekked the full leg. What a remarkable achievement and one that we are told rarely happens. We are all incredibly proud. 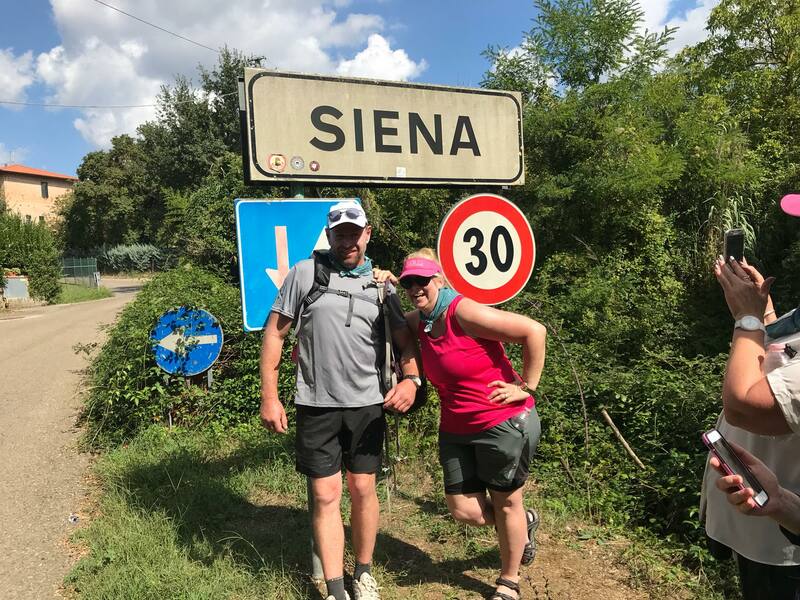 Our ascent into Siena was far steeper than we anticipated and the bitumen roads created a difficult and hot surface that we had not experienced. Our arrival at the "gate" was underwhelming once we discovered that it was the "gate before THE gate!!! 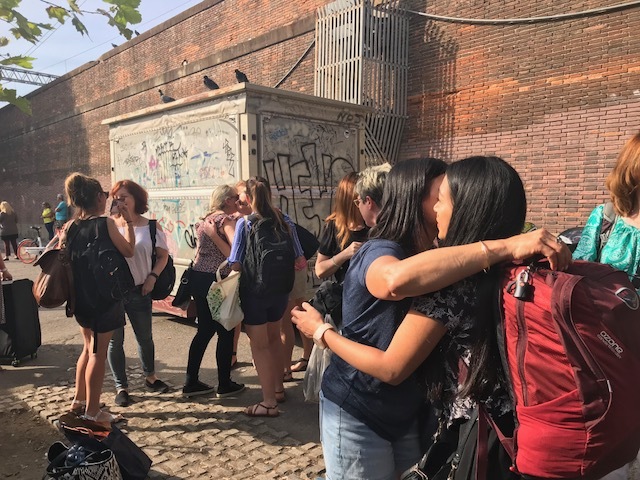 Our actual arrival was a celebration and an emotional time for many. 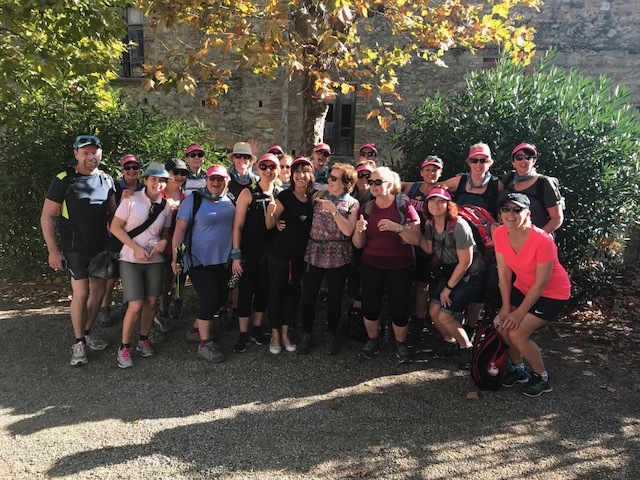 Together we have walked in excess of 150,000 steps over the past five days and close to 100km's. What a mammoth effort. Congratulations to all. Not only for the journey, but the incredible $113,000 fundraising tally. 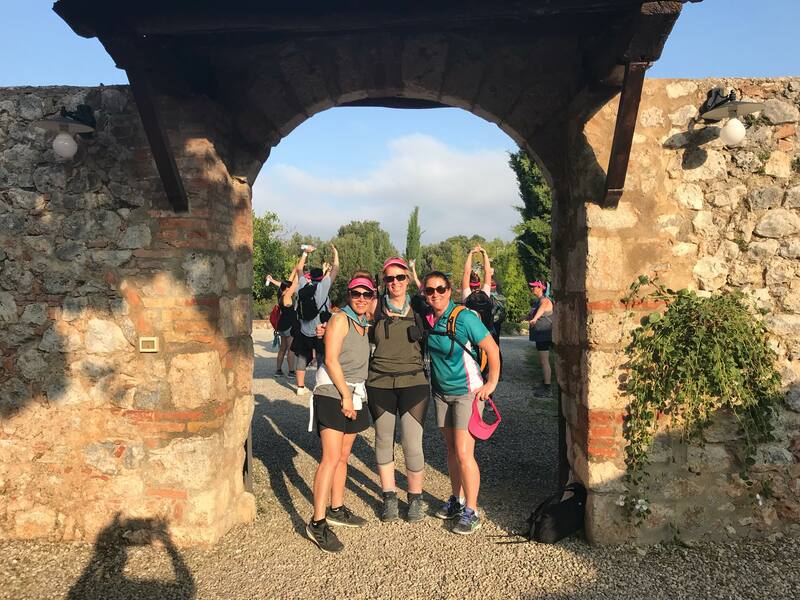 This morning we all enjoyed a much deserved sleep in, after a huge few days walking and many enjoying a late night celebrating last night. 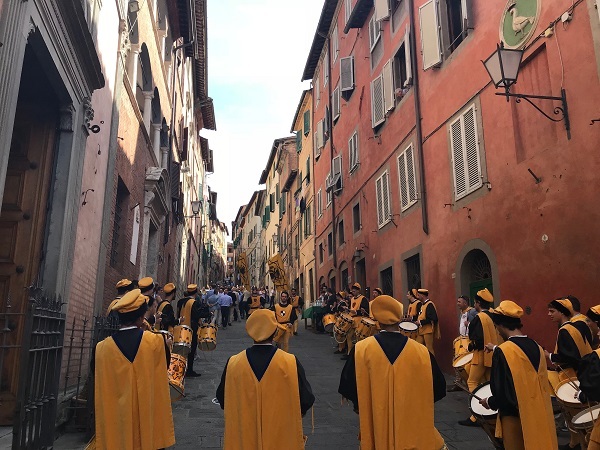 The city of Siena put on a show with the many festivities around the town both last night and during the day celebrating the contrades of Siena. 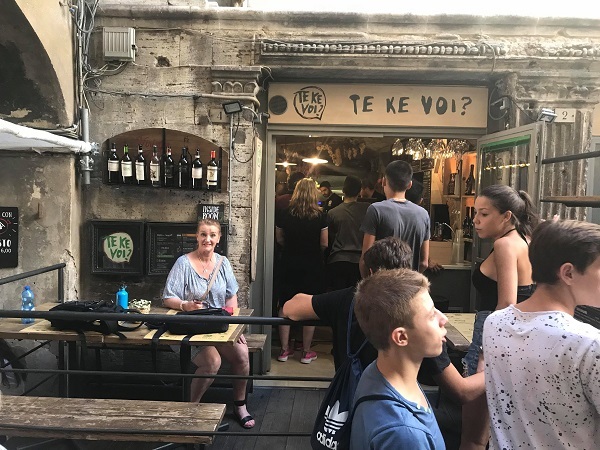 We have witnessed drumming parades through the city streets, colourful scarfs and flags representing quarter of the city as well as a fireworks display at the local outdoor discotheque. 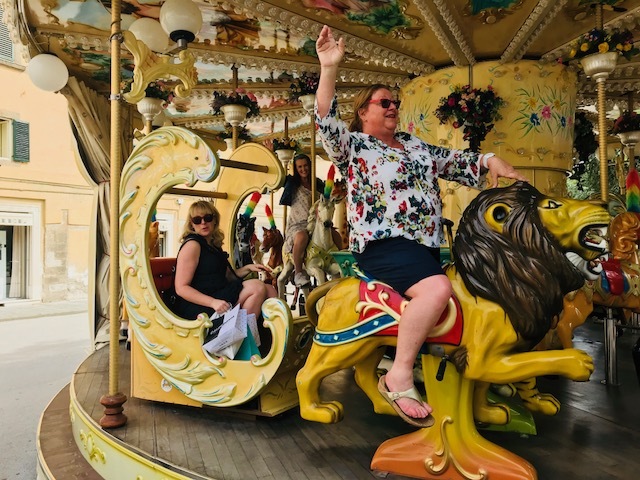 This morning many did a walking tour of the city and then enjoyed shopping and a relax in the afternoon. The local leather and gifts were on most people's list of desired items. 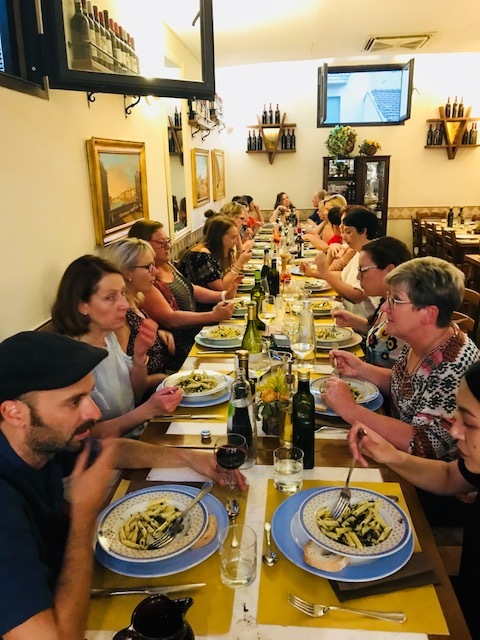 Tonight we enjoyed our final shared dinner as a group. 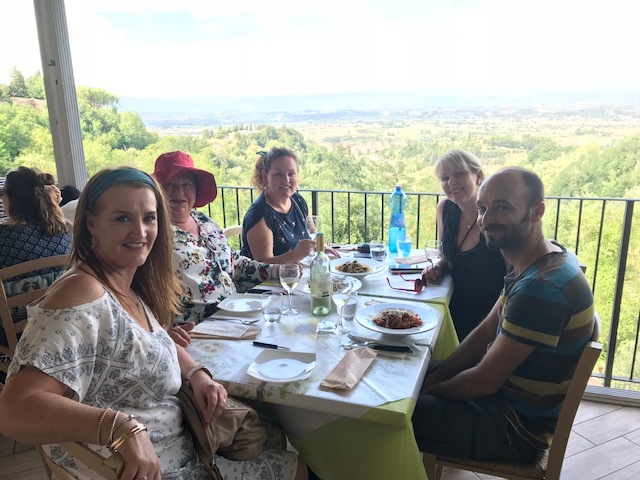 We thanked Andrea for his guiding over the past days and sharing so much of his knowledge of the area, as well as Jade from Inspired Adventures for her work behind the scenes. The highlight was definitely the short movie which Jade put together of the trek and the highlights along the way. 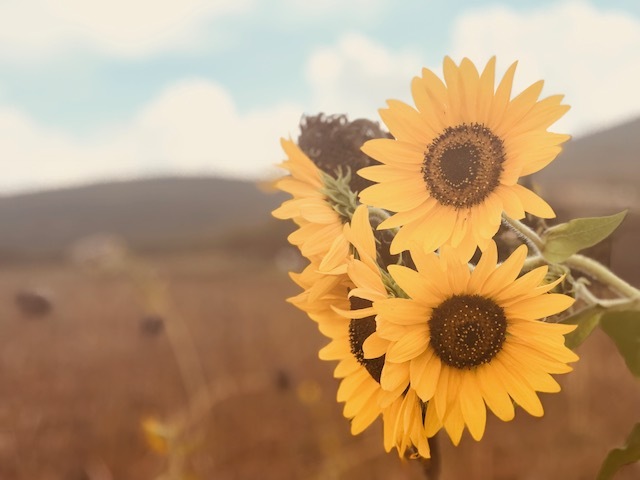 We look forward to sharing this with our loved ones and our OTIS supporters. 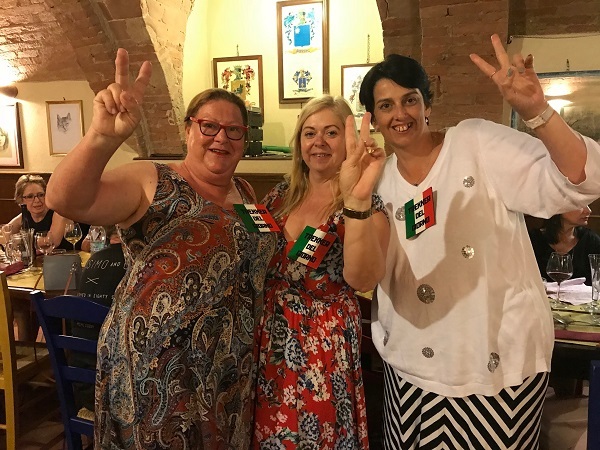 Final "Trekker del Giorno" - We had great pleasure in presenting three "Trekker del Giorno" awards this evening. 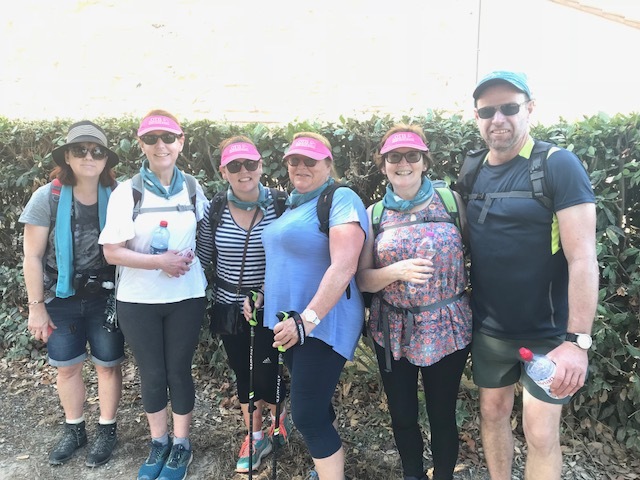 We are so proud that everyone was able to walk the full trek, which we have come to understand if very rare indeed. 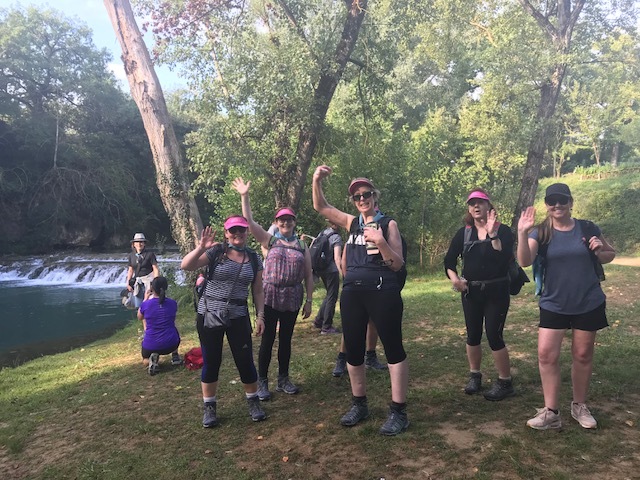 However, three members of our team completed the trek with significant injuries and we are pleased to give the final awards to Amanda, Lisa and Donna. 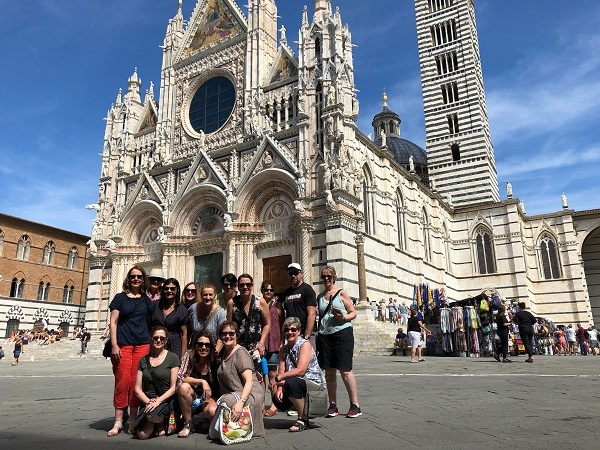 This morning we farewelled the vibrant city of Siena on the last official day of our trek. 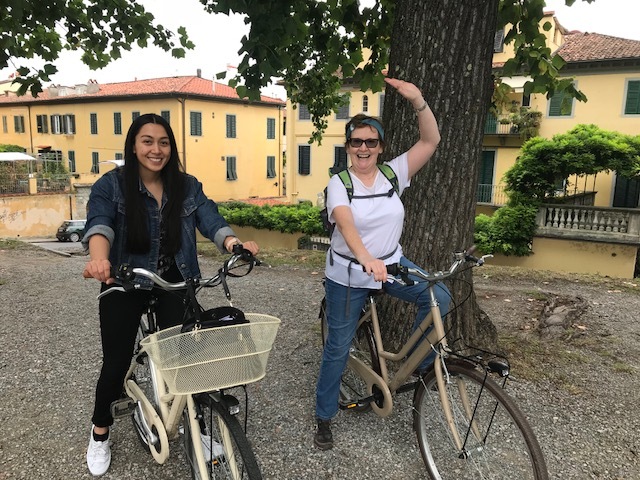 We ate brekky together and farewelled Natalie and Jane who transferred directly from Siena to Venice. Jillian was a late arrival and if the Trekker del Giorno award was still up for grabs, she would have been a strong contender. The bus ride was a little quiet as people took the time to reflect on the last 9 days. 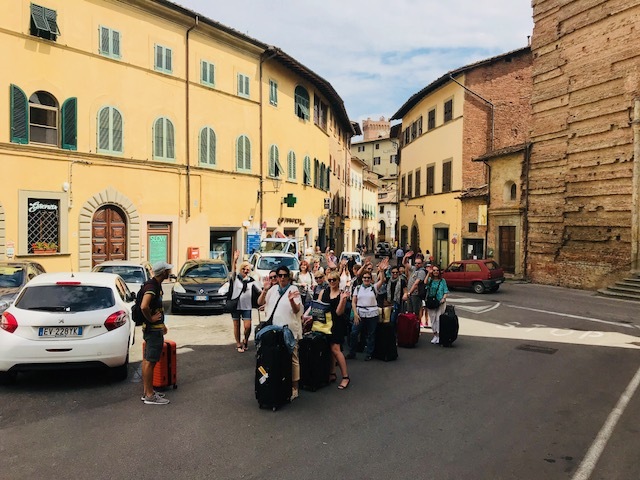 Our arrival in Florence was fairly hectic as people said a rushed goodbye before going to the next leg of their own journey. 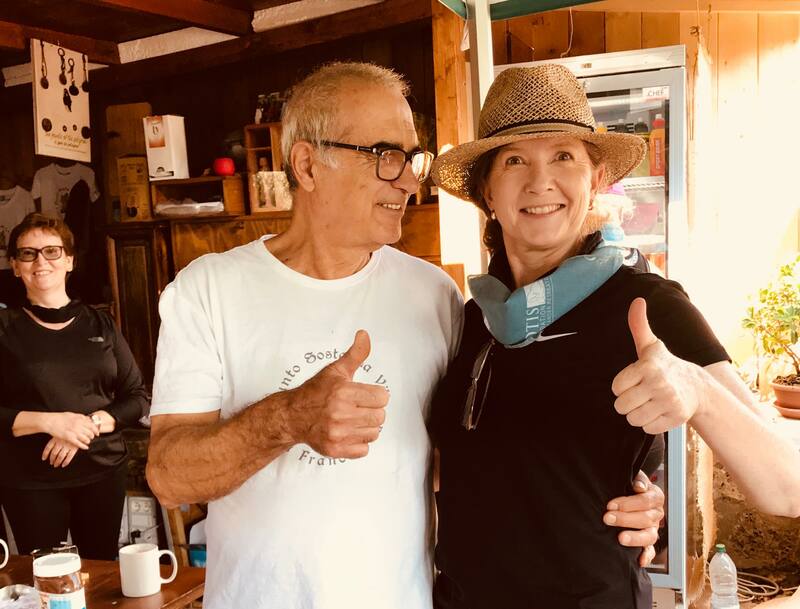 On behalf of The OTIS Foundation, we say a huge thank you not only to the participants but their families and support networks who have assisted with fundraising and keeping the "home fires burning back in Australia. 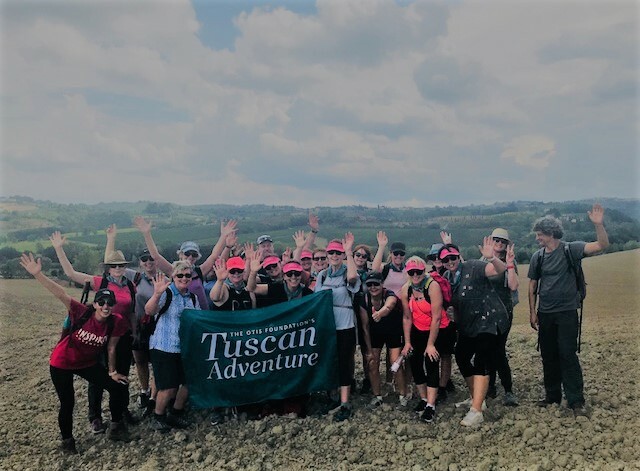 For now, we sign off and say a farewell to the 2018 Tuscan Adventure. Its been amazing! 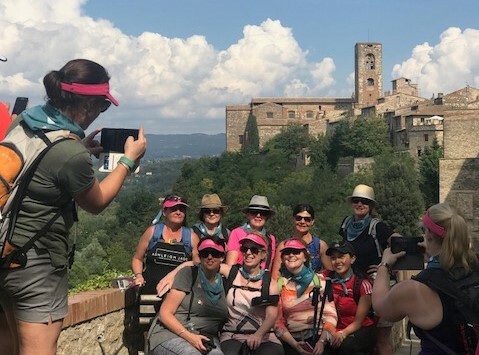 Each year The OTIS Foundation makes close to 3,500 nights available across its network of retreats at no cost to people dealing with breast cancer and their loved ones.